HRTC Recruitment 2019 (एचआरटीसी कंडक्टर नौकरियां भर्ती रिक्ति अधिसूचना) announced by the Himachal Road Transport Corporation. Candidates interested to join in HRTC can apply for the Conductor job vacancy now. As per the HRTC Conductor Vacancy Notification, the application form available online. Applicants can check the eligibility criteria before registering for the HRTC Conductor Application Form on the official web portal. Here we have shared the eligibility scheme, selection process, age limit of Himachal Roadways Recruitment. Educational Qualification: Minimum 10th Class from a recognized organization with a good percentage of marks. 3 Years of Driving Experience. Salary Pay Scale Rs. 5200/- to Rs. 20200/- with a Grade Pay of Rs.1800/-. All eligible and well-skilled applicants searching Government Jobs can apply for Himachal Road Transport Corporation Jobs to fill up the vacant seats. Applicants are invited for the application form has been available on the official website. Here we have provided the HRTC Conductor Apply Online process in an easy way which is given below. Applicants, firstly login to the official web portal. Click on the recruitment tab on the main page. Search the HRTC Conductor Recruitment Notification 2019 link. Read the information or instruction in the notification pdf. Click on the Apply Online link for the registration. Fill the mandatory fields in the form with correct details. Upload the Self Attested documents. Submit the Application form and you can save or download for future references. 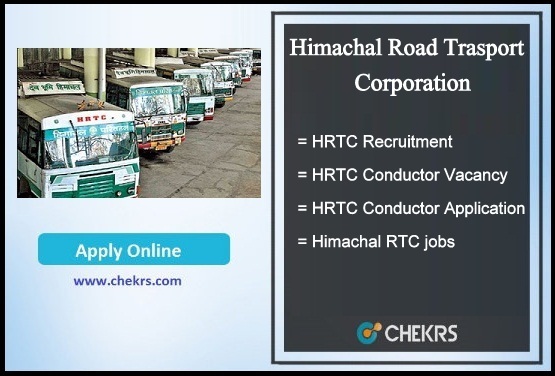 The Himachal Road Transport Corporation is responsible to recruit the applicants for the Conductor & Driver jobs every year. Now the HRTC published the news for the conductor vacancies. This vacancy will be completed in the upcoming days. You can get the More updates about the Himachal Pradesh Roadway Vacancy and latest 10th pass jobs on our web portal www.jobs.chekrs.com. In the case of any query or review, you can place your valuable comments in the commenting section below. We will revert you in a short while.